The 17-year-old admits her first opportunities were "100 per cent" down to her Oasis star father, but insists she's maintained her career with hard work. Anaïs Gallagher has talked about her burgeoning catwalk career, and admitted she's not here by her "own right". 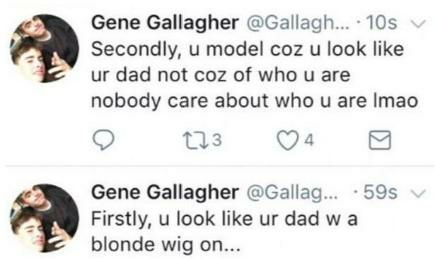 As reported by the Evening Standard, in an interview with Rollacoaster magazine which comes out this Friday, the 17-year-old - who is the daughter of Noel Gallagher and Meg Matthews - discussed being signed to a modelling agency from 11 years old. However, Anaïs - who has secured campaigns for the likes of Accessorize, Reebok, Tommy Hilfiger Dolce & Gabbana - stresses she was only able to make the most of her luck and her name because she's a "hard worker" and has her "own mind". "Like when I wrote about not being able to vote in the general election for Teen Vogue,” she explained. Meanwhile her rocker dad is preparing to release his third studio album, Who Built The Moon? and has given its first single its live debut. Find out why Noel Gallagher is tired of defending Bono and co.